One of the better films in the series, this one finds clever ways to shock us with twists that unfold amidst the battles that are happening elsewhere. Harry Potter And The Deathly Hallows Part 2 is not great. In fact, I have only seen but one great film in the entire series. that was the third movie, Prisoner of Azkaban, which was equally creative and spooky with an almost independent feel to it. nothing that has come since has been nearly as good. of the series, I also enjoyed the first movie, as well as the one that was all about a sort of Olympic games competition, goblet of fire. but after that one, they got kind of lousy. order of the phoenix, for example, was all about an annoying head mistress that took over the ministry of magic, and I suppose Hogwarts as well. part of my problem with these movies is that I never read the books (well, I read the first one, but none of the others), and the movies are filled with tons of little details and character names and objects that are mentioned where we are supposed to know what they’re talking about. sometimes these things are explained, sometimes not. and there is always such an overload of characters, that unless you know everybody’s name, you are in for a lot of guessing and confusion. the last four or so movies have all been incredibly dark. I remember feeling, maybe with the last one, that this stuff wasn’t really for kids anymore. that much I kind of like about the series, I mean I certainly like the way in recent years, other series’ have become more dark and serious than comical. witness the change in the batman movies, from Joel Schumacher’s films to those of Christopher Nolan, or the way the bond movies have been completely relaunched with a totally different tone as Daniel Craig stepped in to fill pierce Bronson’s shoes. but with the harry potter movies, it’s a little different because the heroes are kids. how do you make movies about death and destruction when it’s kids who are being threatened? Well, one way is that you don’t kill very many of the kids. there was the one kid who died in goblet of fire, and that was one of the coolest and most risky things in the series, but otherwise you stay away from that. and if they’re not actually killing any of the main characters, then the threats aren’t very real, are they? these things have always been problems that I’ve had with the series. and yet harry potter and the deathly hallows part 2 is absolutely one of the better movies of the series, because it isn’t nearly as wordy and tame as so many of the other movies. this is supposed to be the movie that goes all out. the final movie of them all. the one that holds nothing back. It doesn’t exactly do that. it isn’t the return of the king of the series with the battle to end all battles that it should have had, but it comes close. the movie opens with the three main characters continuing to hunt down haw cruxes. this is something they have been doing in both of the last two movies, and now for the first time it starts to make a little bit of sense. Voldemort, the villain, has split up his soul into seven haw cruxes (random small objects). only after all seven of those haw cruxes are destroyed will he lose his immortality and be able to be destroyed as well. so before the kids can even think of taking on him, they have to take on the haw cruxes. As if that whole haw crux thing wasn’t enough, there is also the idea of the deathly hallows, which refers to a combination of three different instruments or weapons that Dumbledore left in his will to the three kids. together, these three weapons make up the deathly hallows. but despite giving this movie its title, only one of the three weapons is really given any value in this movie. the wand. 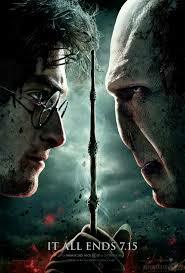 there is a lot of time spent, mostly in the second half, on that can control the wand. it has to be the person who killed the wands last owner. so you can’t use it unless you killed that person or the person who killed that person. it’s not as confusing as it sounds, and actually one of the better plot points of the movie, as Voldemort has to kill certain people just so that he can be able to use the wand. Another cool twist involves finding the last few places where Voldemort hid his soul. one of these places turns out to be the last place anyone would ever think to look. and in order to find it, harry has to visit all of the older people in his life who have passed away. he spends time with his parents, for what is probably the first time in any of these movies. we also get more flashbacks to his parents and their interactions with a young Voldemort and also professor Dumbledore and professor Snape. all very cool stuff. but not everything works. while there is a decent amount of action in the movie, it isn’t overkill the way it should have been. This movie should have left us completely satisfied and not craving more action, and yet at the end of it, that’s exactly what we want. this is in large part because the big battles are shied away from. 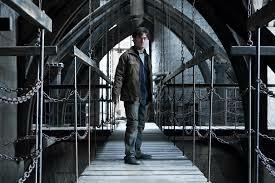 while the battle for Hogwarts takes place in the background and then off screen, the audience stays with harry as he wanders around looking for haw cruxes or looking for Voldemort. we just spent two movies watching him look for haw cruxes. do we really need to follow him doing that in a third? Especially not if it means missing the great battle that we want more than anything to see. a lot of our questions are finally answered in some real, tie the whole thing together with some finality, moments. So, for example, we finally learn what professor Snape has been up to all this time, something that I have been curious about since the first movie where he helped harry defeat the bad wizard in a turban. But there are also a handful of problems too. One scene in particular that I did not care for, brought harry into a sort of world that was all white. And he’s sitting in this world, not knowing where he is, talking to Dumbledore. The scene reminded me of a moment in the third matrix movie, the worst of them all, where Keanu reeves also found him in an all white world. so white that we can’t even make out objects. And in both movies, this white location turned out to be a train station where the right train would take our character to a place he needed to be. This stuff was painful enough when I saw it years ago in the matrix. Watching it here feels like déjà vu. the movie has a lot going for it from new plot developments to twists on things that we thought we had figured out. it does have some significant flaws, but ultimately it is one of the more enjoyable films of the series.